Celebrating three years of Abiathar - Keen Day 2017! Behind every great mod, and even every not so well known mod, is a level editor. With patches more advanced than ever before, the need is arising for smart level editors. Seeing this, I started Abiathar three months ago, as a personal project and programming exercise. Originally just a map editor for the lost episode, it blossomed into a superpowerful Keen:Galaxy editor (of course retaining support for Keen:Dreams). It may be said, “why did you go to all this trouble just to reinvent the wheel? 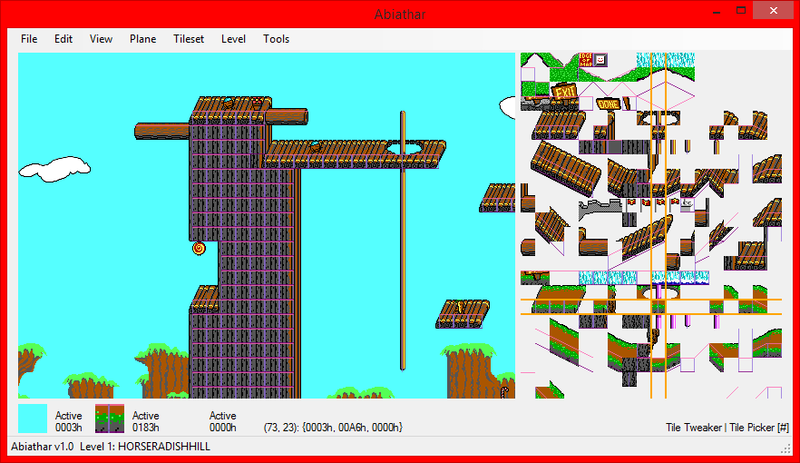 The Omegamatic is already perfectly functional!” TOM is a very nice editor (and on the surface looks very similar to Abiathar), but Abiathar contains many features that TOM simply cannot match due to the language it is written in. Internally stored default resources: don’t need to keep the original files around! Tileinfo editing: tweak your tile properties immediately, without leaving the level editor! Direct EGA graphics reading: don’t worry about exported graphics format! Conglomerate file handling: once you have your resources together, you only need to deal with one dialog to open it again! Tileinfo overlay: never worry about solid vs. secret area tiles again! Inspectors: check your levels for crash bugs without having to load the game! Sound management: add IMF tracks, edit sounds, and set level songs without knowing any patching! Automatic patch/batch generation: easily get started modding! Combinable infoplane: place infoplane sprite tiles in the foreground! Custom, separate infoplane icons: squeeze the most foreground tiles out of your tileset and have visually recognizable infoplane icons! Single-level export/import: share individual level files! All kinds of config file settings: make Abiathar exactly what you want! VeriMaps: sign your levels for authenticity and validate downloaded level sets, in Abiathar or with the VeriMaps tool! Extension API: create your own specialized tools and features, share .NET DLLs to extend Abiathar! Auto-updater: know about new features immediately! Now, let’s look at Abiathar in action! You should really read the Concepts section of the help file before starting to use Abiathar in earnest. Please, read the help file. Please? My plan is to update Abiathar semifrequently, so it’s probably a good idea for you to download the updater, which will fetch the latest version from the right place. To get started with the defaults, go to File – New, select your episode from the drop-down in the upper right, check all the boxes (those are what tell it to use defaults), set the tileinfo drop-down to one that either dumps or reads from memory, and click OK. All the controls are pretty intuitive, but reading the help file is strongly recommended. Once you close Abiathar for the first time, quite a few settings will get saved to the editor.aconf config file. Its format is pretty intuitive, so it should be pretty obvious how to reconfigure stuff. For more details about the formats of values there, read the appropriate section of the help file. Those settings are loaded when Abiathar starts. The *.adeps files created when you save a level set are what can be opened later. They don’t store any level data on their own, just pointers to all the resource files. Please do not try to send someone your levels by sending the dependency binder. Miscellaneous utilities are also packaged with Abiathar, but you don’t need to worry about keeping a folder full of them – just use the File Emitter. Select what you need, choose the output folder, and click Emit! Some of the more useful are FxTomDMh (which can repair TOM-created Dreams files), ManTliMh (possibly helpful when modifying NetKeen levels), and the Galaxy patchers. Abiathar was designed with NetKeen in mind. “NetKeen” is present as an option in the Dependency Collector’s episode drop-down, allowing you to open and edit NetKeen levels. Make sure you select "in maphead" for the tileinfo. If you’re interested in creating extensions for Abiathar, contact me for more information. If you have a bug report (oh no!) or a feature request, by all means pester me until it gets done – but please start by filing an issue at Abiathar Support or by posting something below. Take a moment to thank the beta testers; without their help, Abiathar would not be nearly as amazing as it is. lemm was the first to actually open Abiathar, which was then called Fudge. He requested it to be made into a Galaxy editor, for it was at the time only for Dreams. He also helped with the NetKeen support much later. levellass was the first one I sent it to. She found some very important crash bugs and has continued to provide suggestions for tweaks. Ceilick did perhaps the most important testing: actually using it. 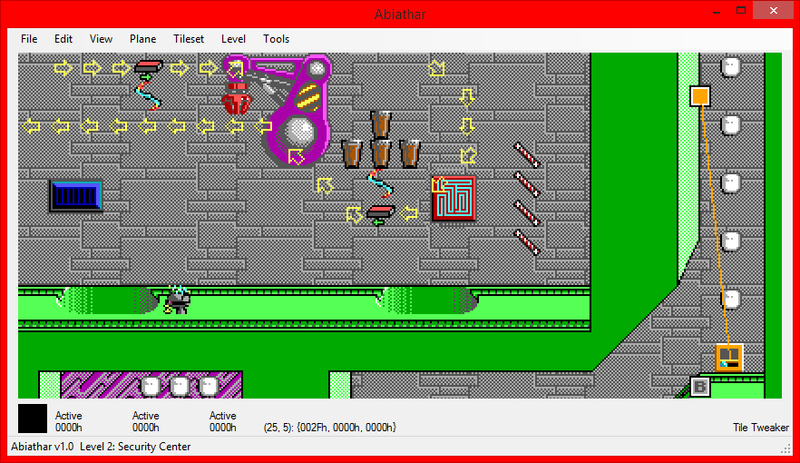 Under his guidance, all kinds of features were added, including the Simultaneous Tileset and Lone Editing mode. Last edited by Fleexy on Thu Jul 28, 2016 19:03, edited 40 times in total. Wow this is massive. Even the manual looks nice! Just one question. Where did the name come from? Looks pretty cool. Maybe this will get me trying some Keen 4 levelling again? KeenRush wrote: Looks pretty cool. Maybe this will get me trying some Keen 4 levelling again? That's exactly what I thought. This editor is really a nice surprise. The new features looks awesome. Plus, the auto updater is something promising. Also, cool name, though I too don't know what it means (not that it's that important anyway). This looks great! I'll definitely switch over to using this for my Keen projects. Do you still plan on adding more features to Abiathar in the coming months? Originally, when this was just a Dreams editor, its name was Fudge because Fleexy understands Keen:Dreams and gives an editor. Then, about a month ago (a while after the expansion to Galaxy), I realized it needed to have a more impressive name. For both sound and meaning, I chose "Abiathar", the name of one of David's mighty men from somewhere in Jewish/Christian history. Other names that were considered were "Cataclysm", "Universal Toaster Cannon", and "Shock Maps." lemm wrote: Do you still plan on adding more features to Abiathar in the coming months? Yes. I already have some tweaks ready; that update will be pushed via that magical auto-updater in a few days. I'd like to add support for migrating Keen:Next maps and maybe for reversing the effects of the super derpy fake Carmackization CK Guy used a few years back. I might add a tileinfo editor in a couple months and I've been fantasizing about integrating graphics work too - that would take quite a while to get a decent UI on it. I'll of course implement any simple features people come up with in a matter of days. Reported bugs (of which I'm pretty sure there are extremely few) will be dealt with immediately. 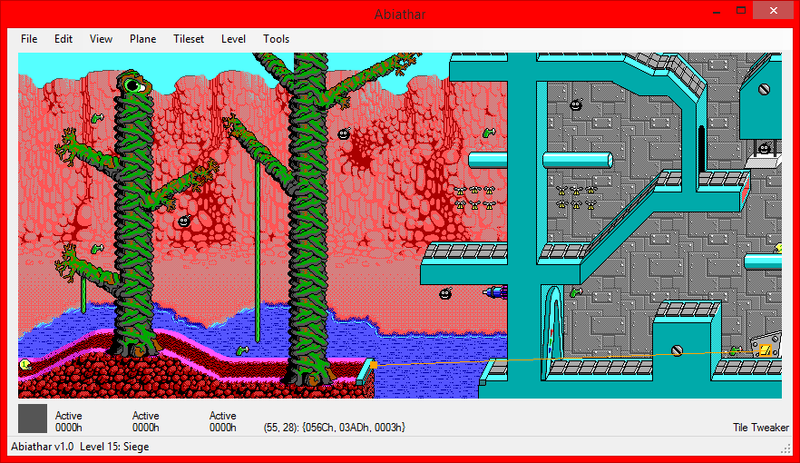 But from what I've seen, Abiathar is the future of Keen Galaxy level editing and possibly of Keen Galaxy modding altogether. This has an amazing tile interface, well done Fleexy! other than re-sizing the map to 208 width and clicking on (208,numberoflevel)? An excellent question! Anticipating this, I had written a section in the documentation about it (see "Tile ID Entry" under "Advanced Use", page 25). I wrote: Right-clicking any of the selected tile bay images will produce a dialog that allows you to type the tile ID to put in that bay. Entering world map infoplane values (and possibly all values) is easier to do in Hexadecimal mode, which displays the number like the selected tile captions do. The following high (first) byte values have special effects on the world map. The low (second) byte specifies the level ID to which it applies. For example, an infoplane value of F00A marks the flag holder for level 0A (10). That's a pretty impressive work-around, I've got to say. I'm honored to have you as a user! Can't get any of this to run under WINE on Ubuntu. Given this is made in MS.NET I assume a Linux port is a long, long way away? What I've seen here and in the manual is neat though. Have you tried Mono? It claims to be a complete Linux implementation of .NET, though I haven't actually looked into it very much. EDIT: Here's a compatibility report; Mono is nowhere near accommodating the awesome power of Abiathar. In other news, the v1.1 update is on the way; we'll see it publicly out in one or two days! Integrated tileinfo editing, anyone?